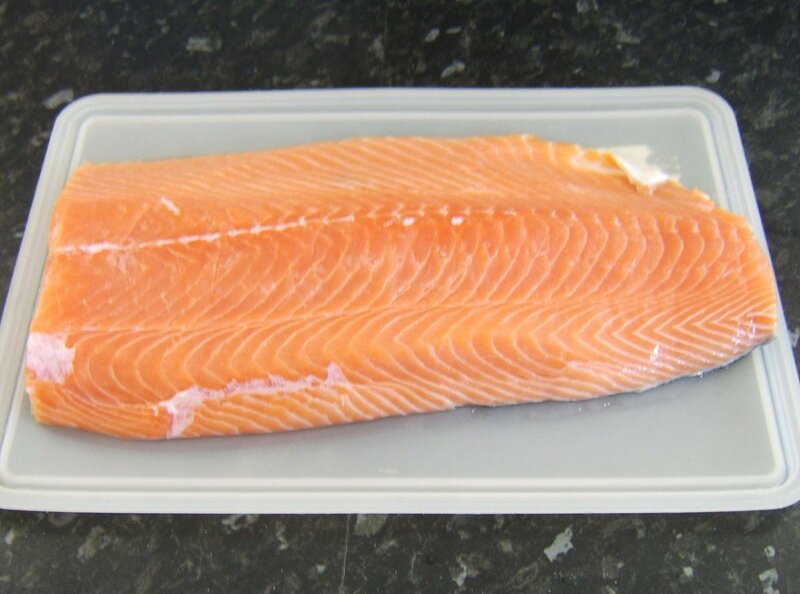 Scottish smoked salmon is often considered to be a great delicacy and can be fairly expensive to buy. Where smoked salmon is something for which you have a great fondness, therefore, investing in a home smoker and learning how to smoke salmon can represent considerable long term cost savings. The salmon can either be cold smoked or hot smoked, each giving the fish a very different appearance and texture. When the salmon is cold smoked, its appearance and texture are very similar as to when it is raw. When it is hot smoked, there is heat involved in the process which cooks the fish as well as smokes it. The procedures on this page relate to hot smoking salmon, although the brining is an essential part of both procedures. Whether you have bought the salmon or caught it yourself, remember that even after it has been filleted, there are still likely to be pin bones which will have to be removed. Your fishmonger may take care of this for you if you ask him nicely but failing that, it is far better to attend to this task prior to smoking than afterwards. These pin bones are found by running your hand along the flesh, against the grain. A pair of tweezers is the ideal tool with which to remove them. You should also take care to ensure that the piece of salmon you have will fit in to your smoker. 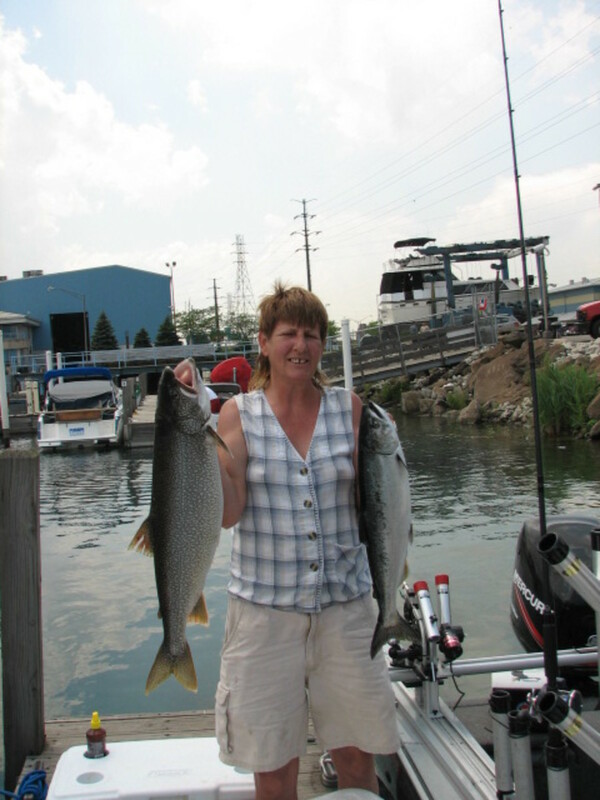 In this instance, the whole fillet was just shy of twenty inches in length and weighed three and a half pounds. It was therefore slightly too long for the smoker. Instead of just trimming a little bit off, a third of the fillet was cut away at the tail (narrow) end and used for an alternative purpose. 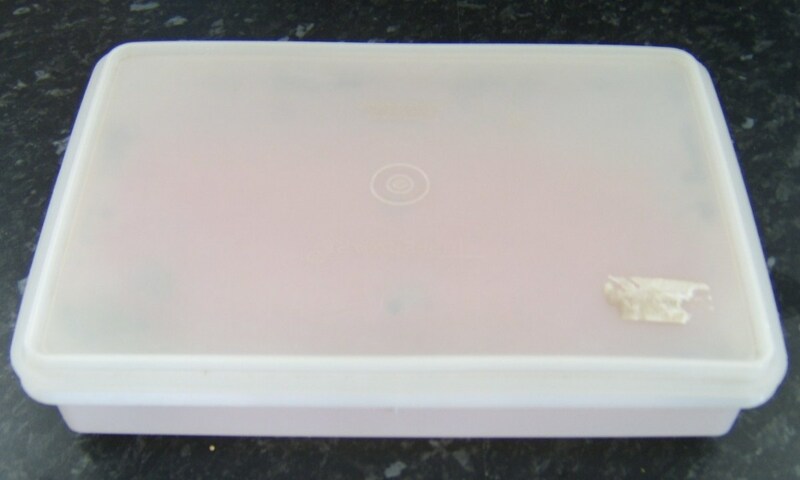 This still provided enough smoked salmon for four generous or six decent portions. It is necessary to season the salmon before it is smoked. There are some who do this simply by rubbing salt and other seasoning ingredients in to the flesh of the salmon but soaking it in a brining solution gives the seasoning a much more even distribution. 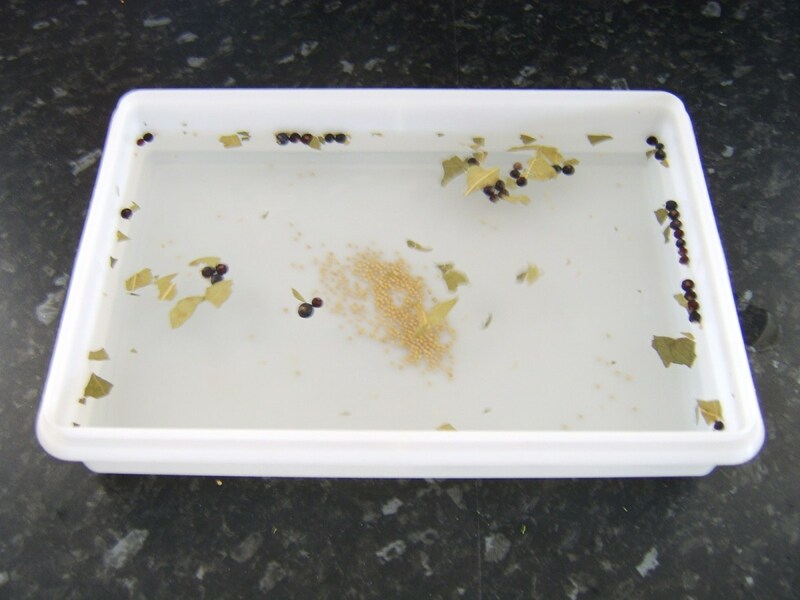 There are any number of brine recipes which you can find from books or from Google but why not experiment to find the one you prefer? The brining solution recipe featured here is one which came about simply through experimentation. 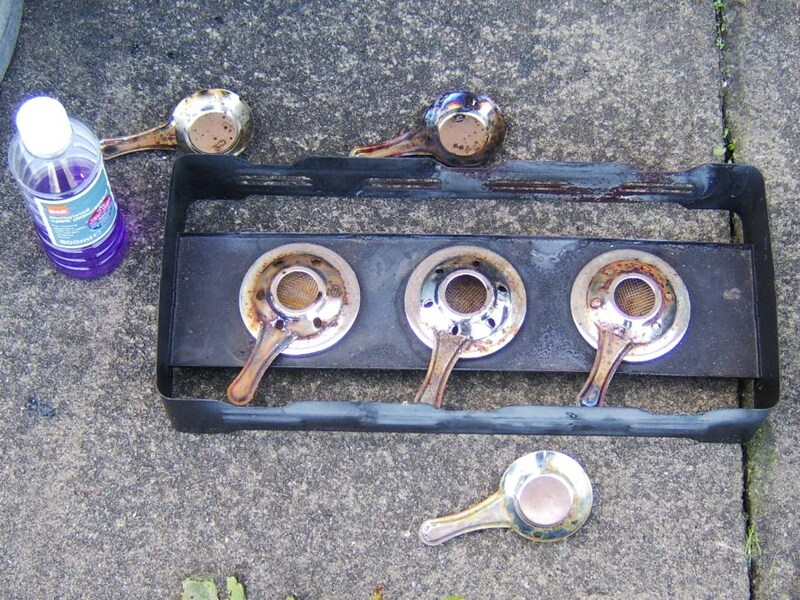 Measure out the cold water in to a large bowl or basin. Add all the other ingredients and stir well to dissolve the salt. Pour in to a dish which is big enough and deep enough to hold the salmon and brining solution. Carefully lay the salmon in the dish and ensure it is completely covered by the brining solution. Cover the dish and leave the salmon to soak for thirty minutes, while you turn your attention to preparing your smoker. The type of smoker which you buy will depend on a number of factors. It will depend on your budget and your own personal preferences but it will also depend very much on the availability of space (outdoors or indoors) in which to use it. There are some smokers which are obviously only for use outdoors but equally, there are other, smaller scale types which can be used in some indoor situations. Be very careful when selecting a smoker, that if you are intending using it indoors, you select one designed for this purpose and take careful account of all safety procedures, at all times. 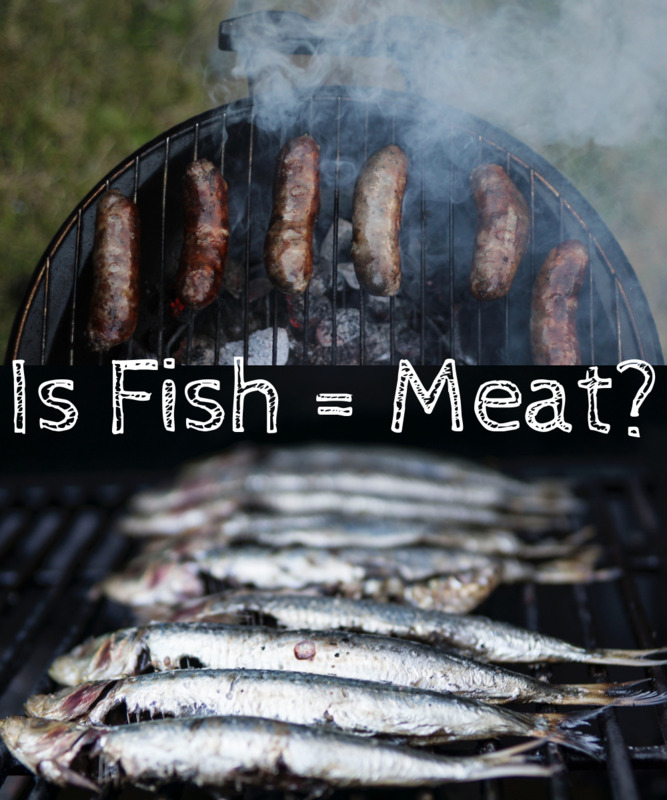 The biggest problem in providing instructions for smoking fish is that there are so many variables attached to the procedure which makes a precise list of the steps and timescales nigh on impossible to provide. One of those variables is the difference in smokers. When you buy a smoker, after you have read the instructions, do not immediately rush out and buy an expensive piece of salmon. 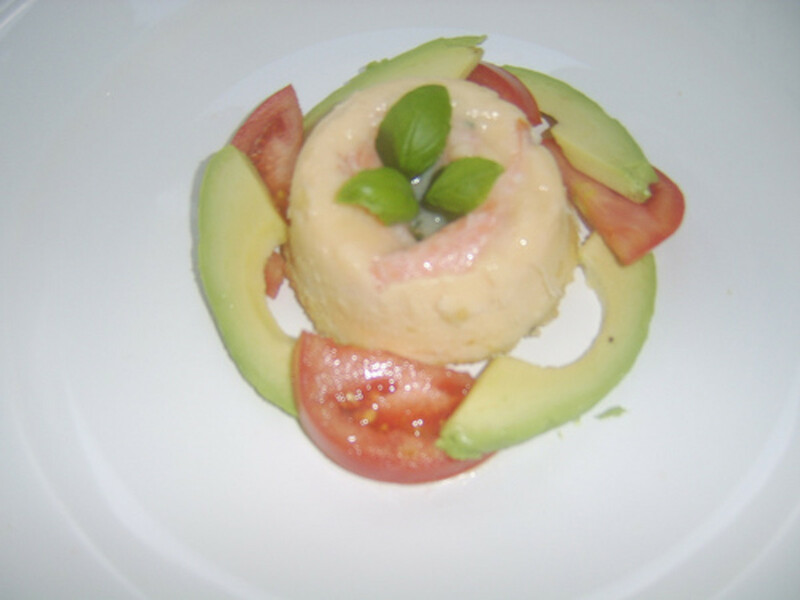 Instead, experiment with cheaper fillets of fish until you get to know your own device. The types of fish which you consider will obviously vary both by geographical location and time of year but mackerel is an excellent choice if you can get it. Mackerel is similar to salmon in that it is an oily fish, making it ideal for smoking, and smoked mackerel is absolutely delicious to eat in many ways. It is necessary to get the smoker on to preheat and get the smoke circulating prior to adding the salmon. This is the point in the procedures where different smokers will require different levels of preparation time and different actions will be required. Reading the instructions carefully for your particular smoker and any experience you have with cheaper types of fish are really what it is all about. This smoker works by having three, meths fuelled burners underneath the smoking compartment. The wood chips (oak in this instance) are added to the base of the smoking compartment, which is sat on top of the lighted burners. 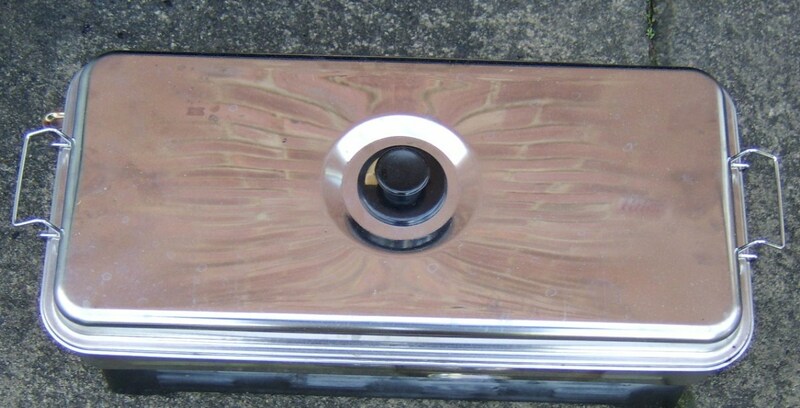 Each burner can be adjusted and a valve on the top of the smoking compartment allows the smoke levels to be controlled. This valve should be closed at the stage of preparing your smoker. This smoker takes about fifteen minutes from the point of lighting the burners to create sufficient smoke for the salmon to be added. This means that starting to assemble and fire up the smoker after the salmon is in the brining solution is nigh on perfect timing. Do always remember that the main body of the smoking compartment will get very hot and that heat protecting gloves should be used at all stages of the procedure. 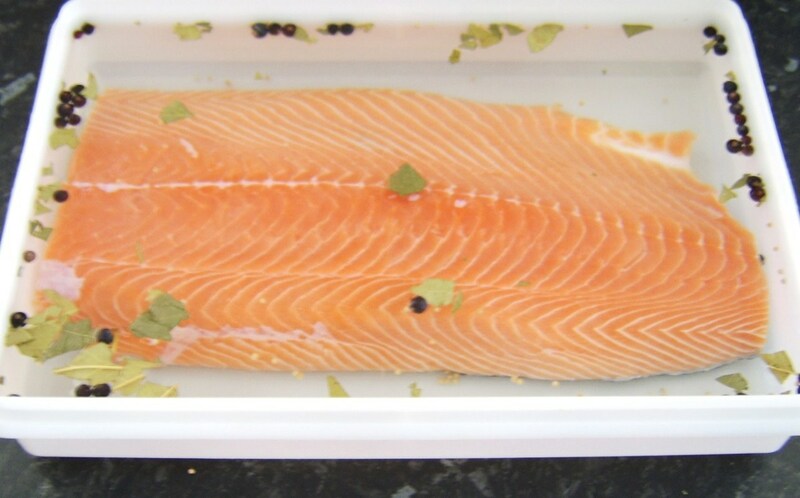 When your salmon has been in the brining solution for half an hour, remove it and rinse it briefly under running cold water to remove excess salt crystals and perhaps any pieces of seed, berry or leaf. Pat it gently dry with kitchen paper. Lay it on your smoker rack, skin side down, and carefully in to the smoking compartment. Experience will fairly quickly teach you how long salmon takes to smoke in your smoker and the eye will quickly learn how to tell when it is done. At first, follow the instructions for the smoker and check for doneness by carefully easing a sharp pointed knife in to the thickest part of the salmon and looking to see whether it is cooked right through. Remember, salmon should never be overcooked or it will dry out. 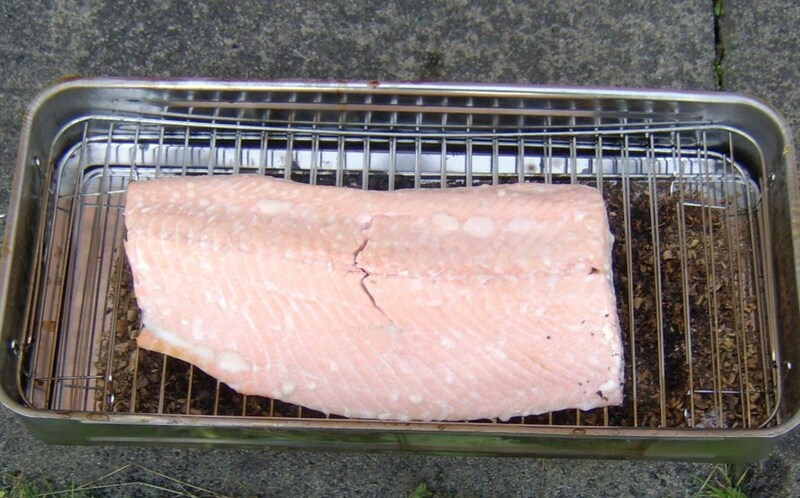 This piece of salmon, in this smoker, took just twenty minutes to cook to perfection. The smoked salmon can be served immediately while still hot or left to cool and served cold. 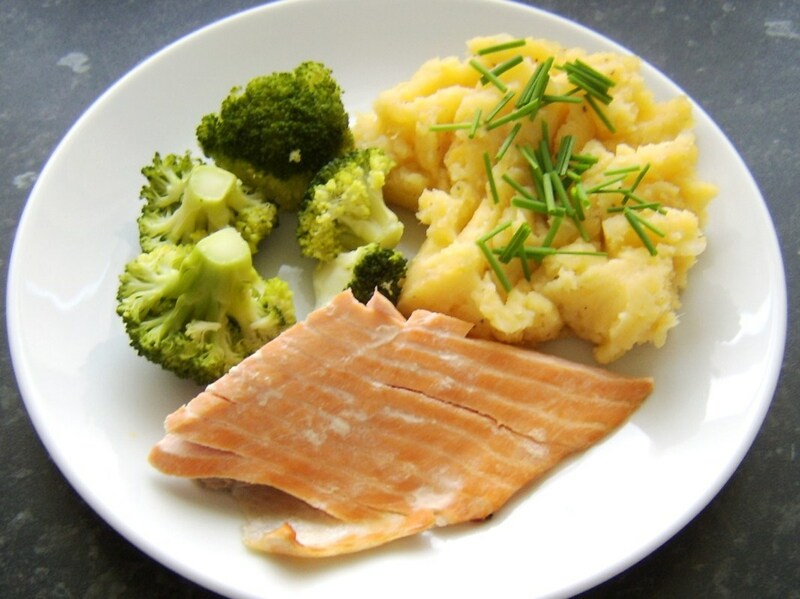 This piece of smoked salmon was served hot with clapshot and broccoli. 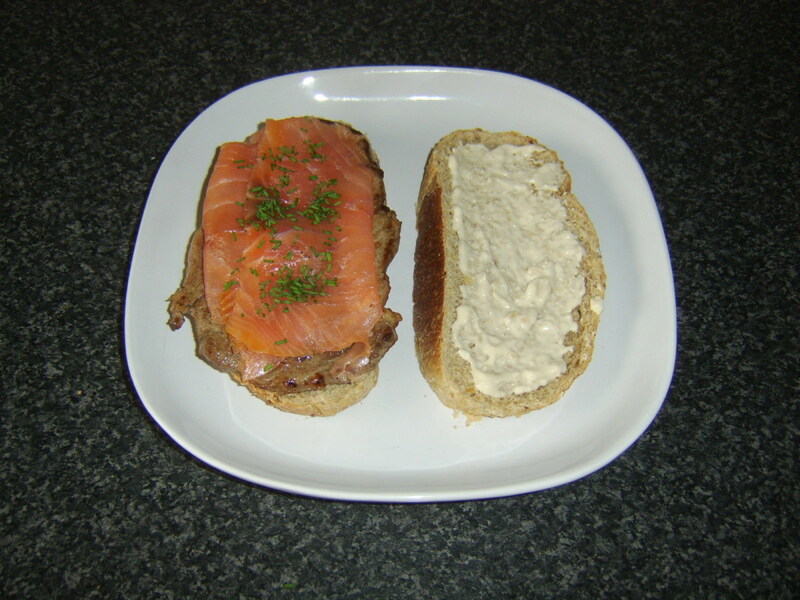 4.5 stars from 4 ratings of this Scottish smoked salmon recipe! Are You a Fan of Smoked Salmon? 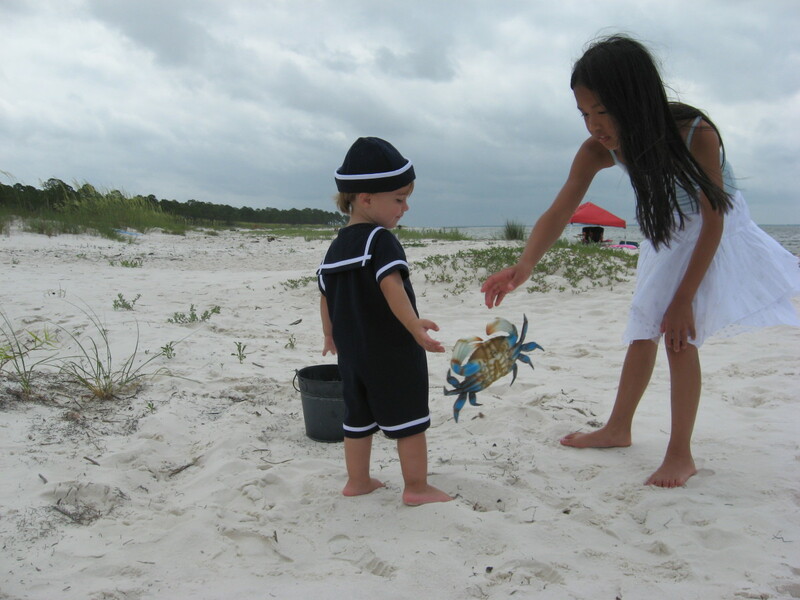 Thank you for visiting this page and I hope that you have found it interesting. It is amazing how much fun can be had with a smoker and as well as smoking salmon and other fish, you could try smoking beef, chicken, duck and a great deal more. Any comments or feedback which you have may be left in the space below. I've never tried smoking a whole salmon like this but can't think of any reason why not. Would obviously however take longer in the smoker to become cooked and you'd have to watch it carefully to catch it just at the right time. Can I smoke a whole salmon the has been cleaned but still has the bones & skin in place just has been gutted & head removed. 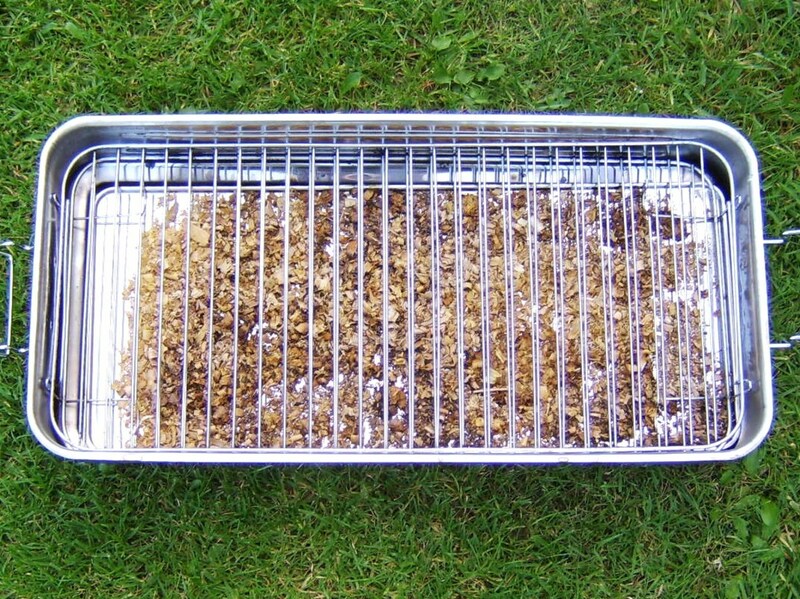 I've just bought a landmann Tennessee smoker so your help here on how to smoke salmon will come in very useful. The blow by blow steps and helpful pictures will all aid me in making my own tasty salmon. thanks for your terrific effort and for sharing. Thanks for your comment and although I am afraid cold smoking is not something I have ever personally done, I have found a link which may be of use to you in this respect. I have now hyperlinked the words "cold smoked" in the introductory paragraph to this page and hope it's of use to you. Good luck with your salmon smoking! Do you have instructions for cold smoking please. Gordon Hamilton: What a harmonious, informative, precise merger of illustrative photographs and precise text! It is most helpful the way in which you take us readers through the steps of preparing, smoking and serving the scrumptiously fresh salmon. In particular, it is most welcome to have the information for a complete meal with broccoli and clapshot so decoratively and enticingly photographed. Hello, funmontrealgirl. I agree with you aboslutely - I love salmon, especially smoked. Thank you very much for visiting the Hub and commenting. Salmon is amazing. Smoked salmon is awesome so I love your recommendations. Thank you for the visit and comment, randomcreative. I'm glad you like smoked food and hope you get the chance soon to try it out yourself. Hi, Tony. 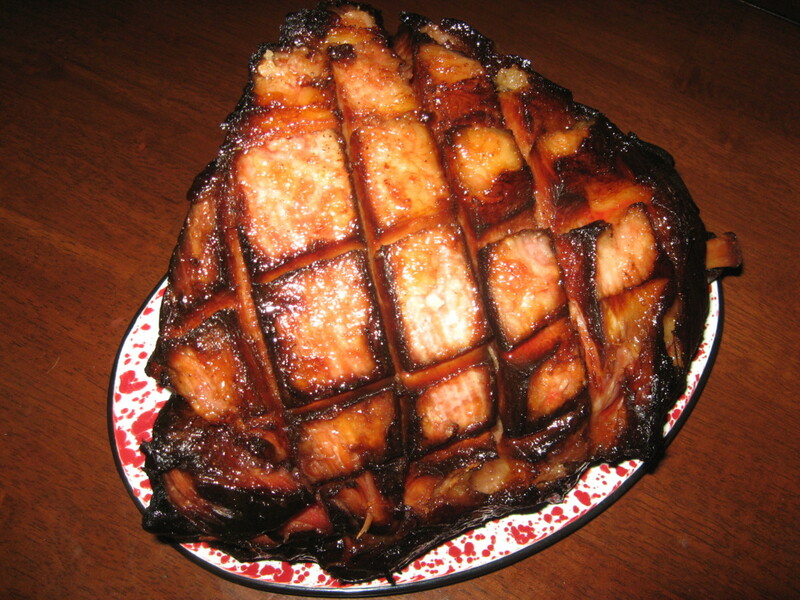 I love experimenting with smoking and applewood, as you say, is a fantastic option when you can get it. Cheers. interesting subject smoking, I like the flavours and using different types of wood will give you a slightly changed flavour. I dry out twigs from my apple trees to use for smoke a slightly sweeter smoke than oak. well done as usual Gordon. 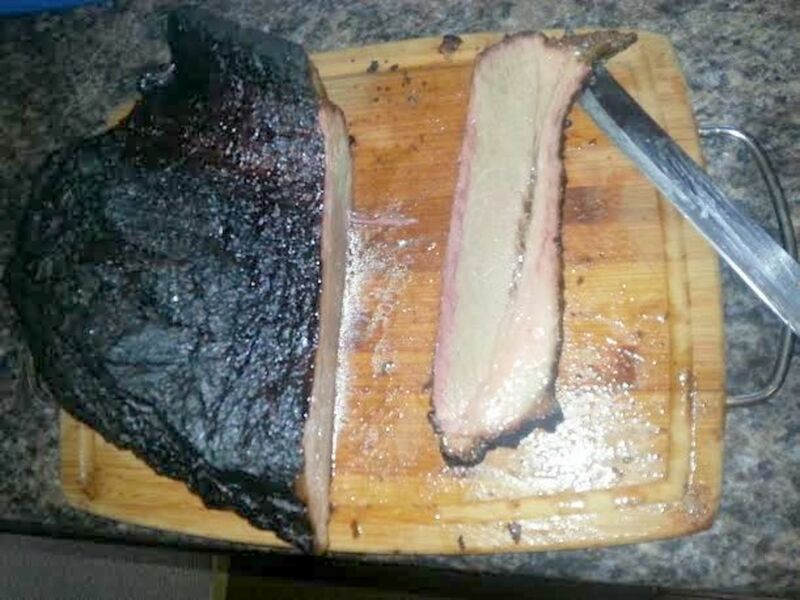 I have never used a smoker before, but the smoked meat that I've had prepared at home by others has always been amazing. I would love to try this sometime. Thanks for the recipe! David, yes it certainly did and that is still on my "To do" list. I'll get to it! Thanks for the visit and comment. Wow - I love smoked salmon, but have always just purchased it already prepared that way. 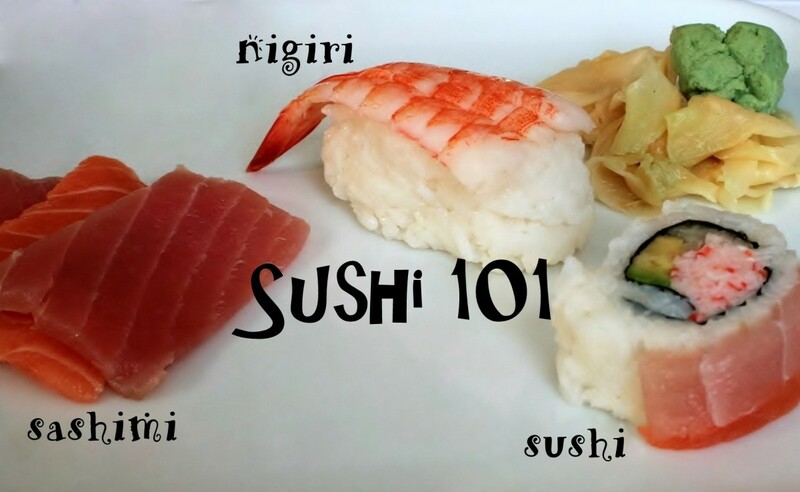 Great tips, photographs and directions. Mmmmmm - I am hungry now. Voted up! Thanks, NMLady. Yes, that is unfortunately the problem with a lot of fish, not just salmon, that not everyone has ready and affordable access. Perhaps you will be inspired to try smoking a foodstuff which you do have ready access to? If you do, I hope you enjoy it. This looks good but i would have to take a loan out on the house to buy that much salmon here in the desert.